Smack in the middle of the soul-crushing, creativity-robbing exercise known as getting a new kitchen - hot plate futures are still up, if you get my drift - my wife and I loaded up the car and headed up to Ottawa for the weekend. We had planned this because she wanted to go to Winterlude, their annual celebration of all things winter. This just happened to be the weekend when the winter storm (the one named after the famous animated Disney fish) was barging into New England. I usually ignore meteorologists when they use words like 'strong' and 'big' to describe storms, but once the word 'historic' is thrown into the mix, I pay attention. You know nature is pretty messed up when you escape winter's wrath in Connecticut by going to Canada. But that's what we did: While fistfights were ensuing in northeast grocery stores over the last box of Cheez-Its, we peacefully headed north and spent the night just north of Syracuse, New York before pressing on toward the Canadian border. During which time, we felt Nemo's breath on ourselves and the other travelers that morning: here's one my wife took from the passenger seat of the Element. Now if you ever become downtrodden in the middle of winter, when your bike is hooked up to a hamster wheel/trainer for one watt too many, when you have to dress like Randy from A Christmas Story to pedal anywhere at all, I recommend that you go to Canada and ride there. It is stuff-your-unconscious-friend-in-the-belly-of-a-dead-Tauntaun cold, but the bike scene is still thriving. 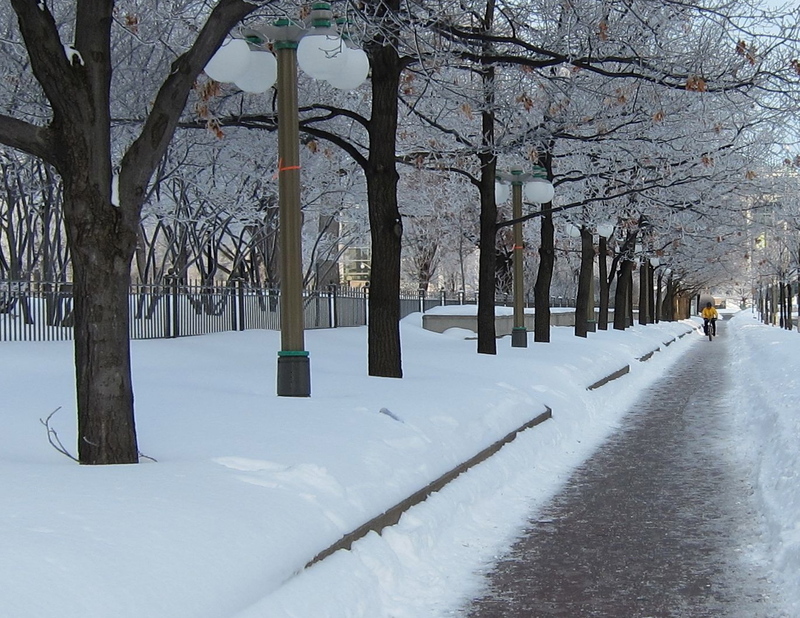 We arrived in downtown Ottawa around lunchtime, just as Nemo was closing up businesses and sending people home early in the states. 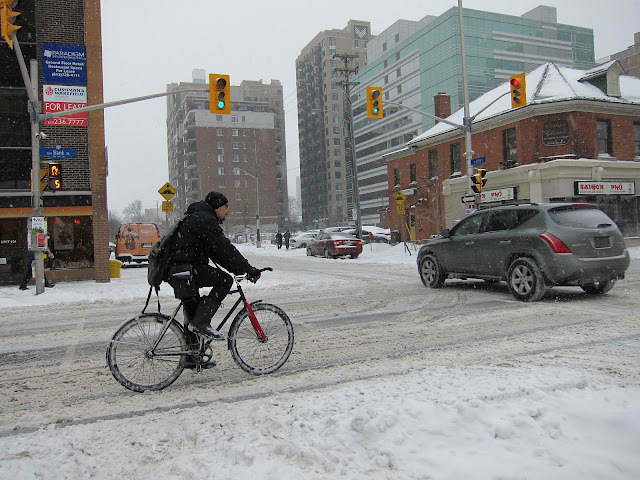 I wouldn't have believed it with my own eyes if I didn't see it myself, but I saw more cyclists in five minutes of blizzard conditions in Ottawa than I did in three days of riding in the tropical conditions of the Dominican Republic. Wrapped head to toe with protective winter gear, we trudged through Ottawa. From time to time, we'd hear dispatches from friends - mostly in the form of whiny Facebook status updates - and see news reports to see how the state we called home was faring. The contrast was astonishing as Connecticut and Massachusetts seemed to be shutting down while we were surrounded by people who often didn't even seem aware it was snowing. I had to hand it to them. Curious about the equipment the Canadians had to use bicycles to go about their everyday lives, I visited a bike shop called Pecco's in Ottawa to see what gear they carried. Now I would have thought that, of all places, Ottawa would be the place one would find bikes like the Surly Pugsly in great numbers. Here's a couple I saw in a shop in Maine last year. They're the ones on the left with the nearly four-inch wide tires. Ottawans, as it seemed, were having none of it. The bikes I saw looked like they'd be at home absolutely anywhere during the other three seasons of the year. A clerk at Pecco's showed me the assortment of studded tires available for bikes but said most people just use the tires they have. 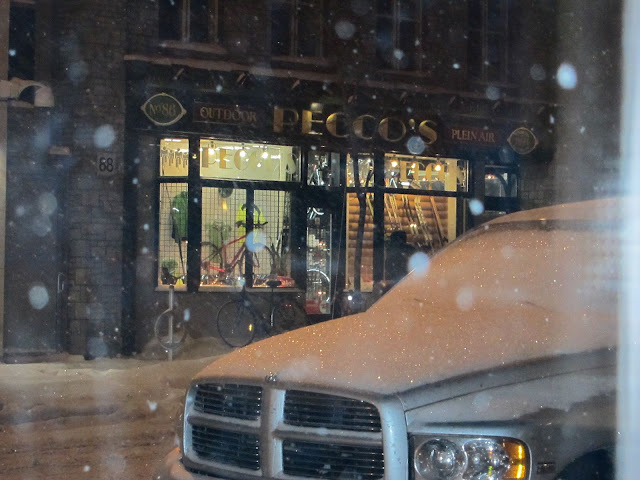 Pecco's also sells an assortment of other common winter gear like ice skates and curling equipment like the little brushes. Yeah, if you want to own a successful bike shop, you must know your market. 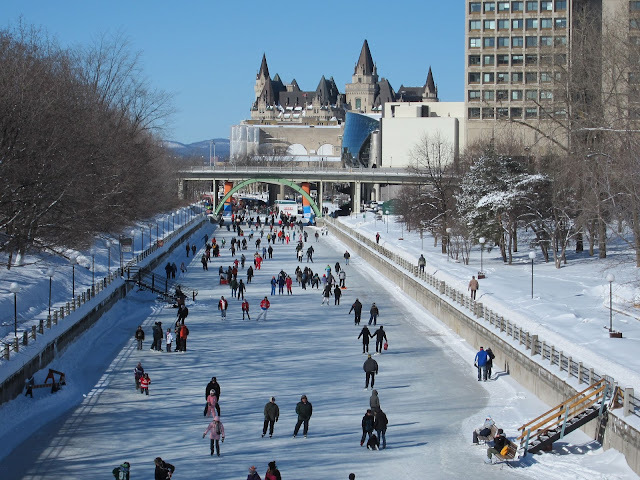 I imagine Pecco's was doing a brisk business in ice skates, for during Winterlude a common activity was to ice skate along the frozen canal that runs for several miles through the center of the city. We did this, and it was quite nice. 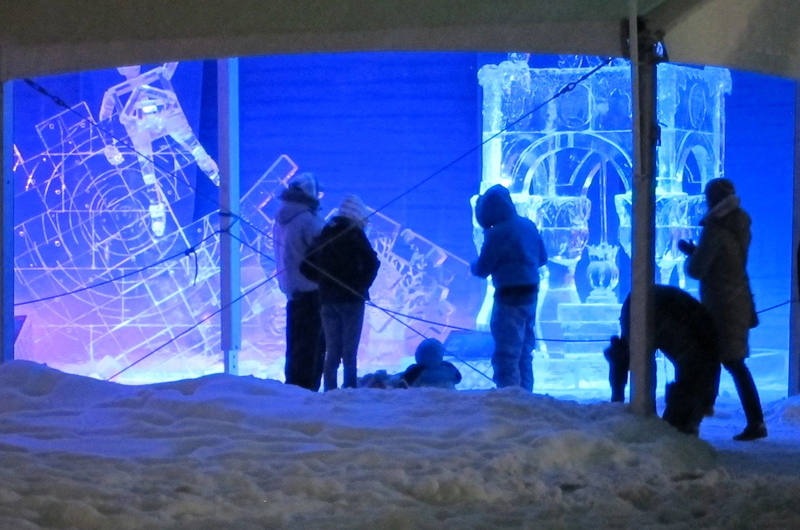 The celebration also included an ice sculpture exhibit. Not some three-foot high swans melting all over someone's wedding reception buffet, but room-sized works of art. Finally, you never truly understand the contrast of Canada during a blizzard and Connecticut during a blizzard until you visit an outdoor Winterlude concert. The drummers were drumming and the dancers were dancing as though nothing was happening. 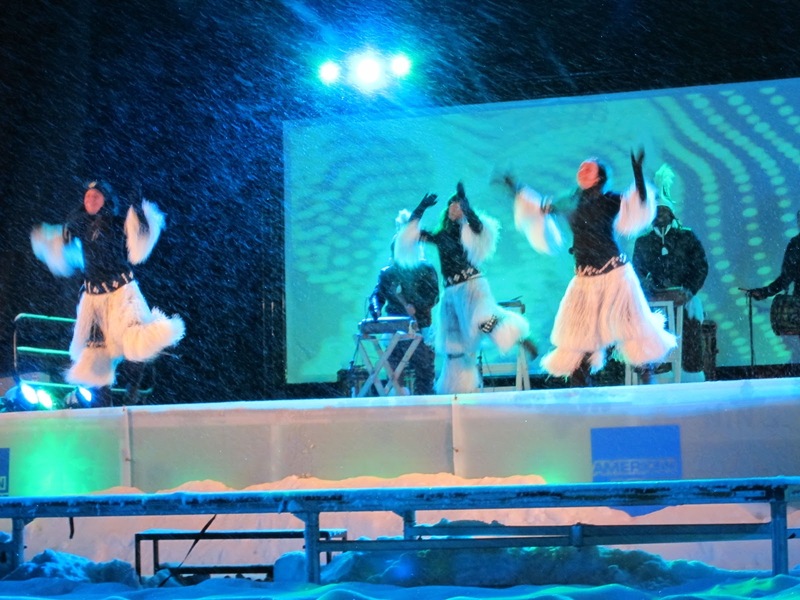 Some of the attendees were so rapt during the performance snow was piling up on them. We stood in the snow admiring the performance until we could stand the cold no longer and we trudged to the hotel. 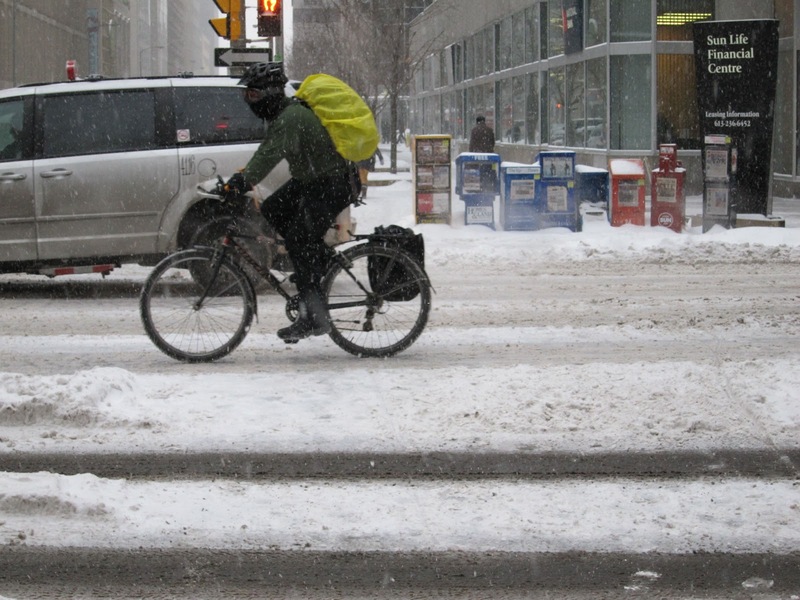 The way these people celebrate rather than be frightened by freezing temperatures is something to be admired, as is their willingness to bike through it. Sadly, I was unable to join their ranks as an unfixable hole in the stem of the bike I brought (South Norwalk) kept me from pedaling anywhere. Even though it was a big disappointment, I did begin to wonder if it meant I'd simply have to return to Ottawa at a later date - perhaps when the weather is warmer. 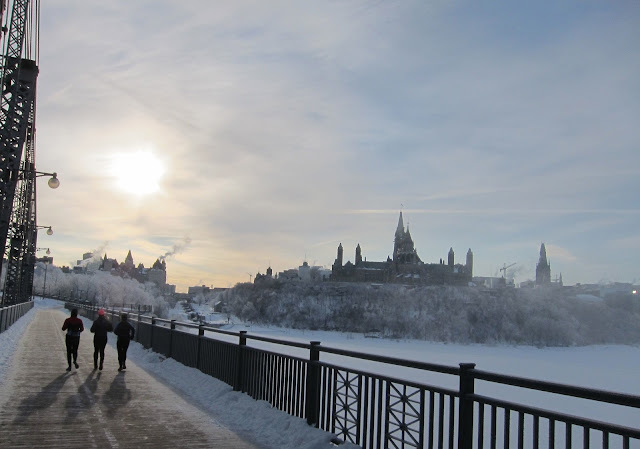 The last morning of our trip, my wife sketched Parliament Hill while I crossed the bridge into Quebec - on foot - so I could look back at Parliament Hill. Shortly after, a nine-hour push got us home, where it took ten minutes to shovel our way into the house. It wasn't until a few days later, during a bike ride on the recumbent in Bridgeport, that I finally understood just how much snow we got. 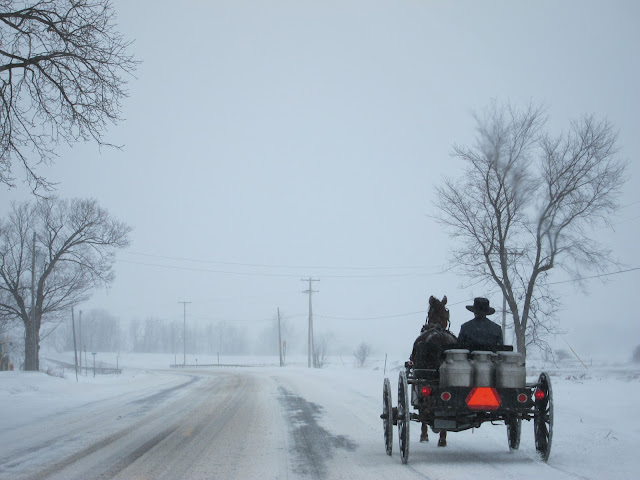 It made me hope the Canadians would visit New England to teach us a little bit about how to deal with winter, and it made me wish New Englanders would visit Canada to learn how to see the fun side of a cold season. Clearly, some are. Thanks for reading and thanks for riding.